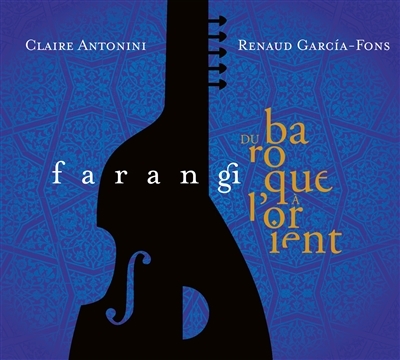 Renaud Garcia-Fons & Claire Antonini, two exceptional musicians, formed a duo several years ago. Their music has been enriched over time, each musician bringing unique experiences and passions for early music, jazz, and oriental music in the broadest sense. The love for melody, for the rhythms of ancient traditions, for modal music expression, combine to give this project its unique sound. The repertoire of 19 short pieces, primarily original compositions, are miniatures, describing imaginary travel to a cultural crossroads. Here the double bass sounds like a ney, the theorbo like a setar. Both voices are heard, yet the rich combination of timbres and modes of playing are ever renewed in the orchestrations. Farangi, the foreigner in Persian, the traveler coming from west, wishes to celebrate and share this natural connection, the pleasure of soul that connects different music styles, as a universal language speaking to everyone’s heart.